We’ve reached Adelaide and feel pleased with ourselves. The riding was very hard to begin with but since leaving Yackandandah we’ve progressively got fitter, faster and more efficient at this kind of independent travel. The weather has finally started to warm since the first very cold days of riding through the Australian highlands. There was a night when we cycled into Goulburn and it was trying to sleet as we searched for our motel. It’s not always been easy cycling but recently our riding days have been characterised by sunny rides into more remote areas of unmade roads where we’ve camped wild carrying all our own food and water. This idea of independent travel we see everywhere in the Australian phenomenon of the ‘Grey Nomad’, typically retired couples who travel the country in camper vans, tracking the warm weather, their relatives and travel whims in cumbersome vehicles through the country. Every other vehicle we seem to see is a camper or a four wheel drive pulling a more robust version of a caravan. It would appear at the campsites that these travellers transport a version of their own domestic arrangements of living rooms and kitchens with them. They carry televisions, satellite dishes, collapsible dining tables and chairs, all as if they’ve never left home. I’d first read about these kinds of contemporary nomads in a book called ‘Ghost Riders: Travels with American Nomads’ by Richard Grant. He describes how a whole population of North Americans travel their continent with the weather. When it was summer, they’d head to Alaska and Canada and when it was winter, Florida and Texas. They dodged taxes and lived under the radar of Federal Government. In Australia they head to Queensland in the winter and to Victoria and the Murray River in the summer to try to escape the heat. We meet these Grey Nomads all the time in Australia. Some are really transporting their suburban baggage with them whilst others are actively rejecting it. 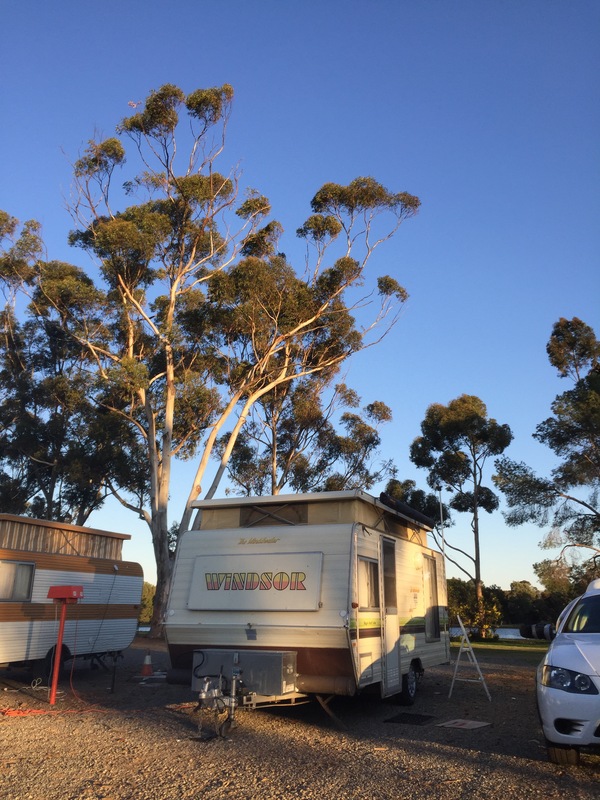 In Cootamundra we met a couple who’d been on the road for 11 years, had no fixed address having sold up everything, and delighted in telling us the story of finally getting rid of their double bed – through an upstairs window, into a skip and off to the rubbish dump. I warm to these people but sometimes less so with others. The retired gentlemen we see in their dressing gowns and slippers carrying shaving bags to campsite washrooms – why did they ever leave home? The Great Ocean Road now beckons along with Melbourne. After a few days in Adelaide we’ll be pedalling there soon. How wonderful you have made it. So hope you get to meet Amanda. I seem to have forgotten you were heading to Melbourne. I do not want to cramp your style but I have so many friends there. Not that you want to go on a social whirl, but Sue is there (you know Sue, from Christmas Eve at my place and then in Peasenhall). Also I can early set a place for you to stay if you needed it. And always no strings attached. My dear friend Victoria would love to meet you. Thanks Mark. Will reply via email.